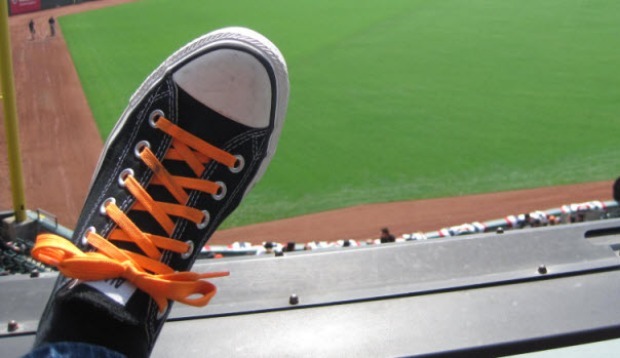 A sea of orange and black flowed around AT&T Park Friday as tens of thousands of fans flocked to the stadium for the defending World Series champion San Francisco Giants' home Opening Day. The crowds lined up early, eager to get inside and soak up the festive atmosphere and pre-game ceremonies, which included the raising of the 2012 championship flag. Giants announcer Jon Miller kicked off the proceedings by introducing the visiting St. Louis Cardinals -- the team the Giants defeated last October in the National League Championship Series to advance to the World Series. While many Cardinals coaches and players received little applause, or even drew a chorus of resounding boos, as was the case with Carlos Beltran, the crowd cheered for former Giants players Mike Aldrete and Mike Matheny, the manager for St. Louis. Cardinals hitting coach Bengie Molina, who played for the Giants from 2007 to 2010, got a standing ovation from the crowd. With the words, "and now the defending World Champion San Francisco Giants" -- which elicited a huge roar from the some 41,000 fans in attendance -- Miller introduced manager Bruce Bochy, who emerged from a gate in center field carrying the 2012 World Series trophy. 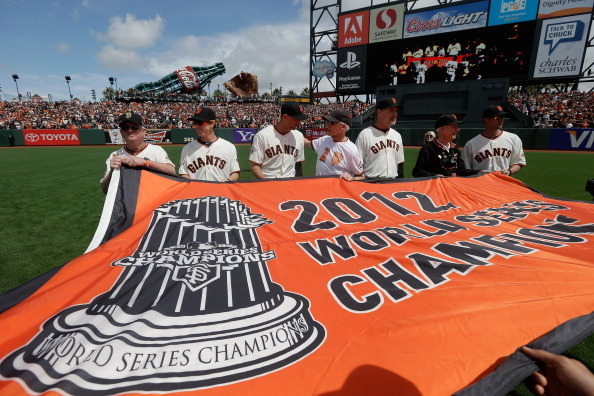 Hoisting it in the air and turning around, Bochy showed off the Tiffany trophy to fans around the ballpark, as he walked to the infield behind second base and placed it on a stand opposite the 2010 trophy. The clubhouse staff was then introduced, followed by the players, all of whom walked one by one from the center field gate and then jogged in between the two trophies before lining up along the third base line. National League Championship Series MVP Marco Scutaro and World Series MVP Pablo Sandoval threw out the ceremonial first pitches, followed by a montage of video clips highlighting the 2012 season shown on the scoreboard. Giants public address announcer Renel Brooks-Moon then took over, exclaiming, "now the moment you've all been waiting for!" and a shot of McCovey Cove appeared on the jumbo screen of the scoreboard, zooming in on an approaching San Francisco Fire Department boat. As it got closer, the crew began unfurling the 2012 World Series champions banner, and the boat docked along the Port Walk outside the right field wall. 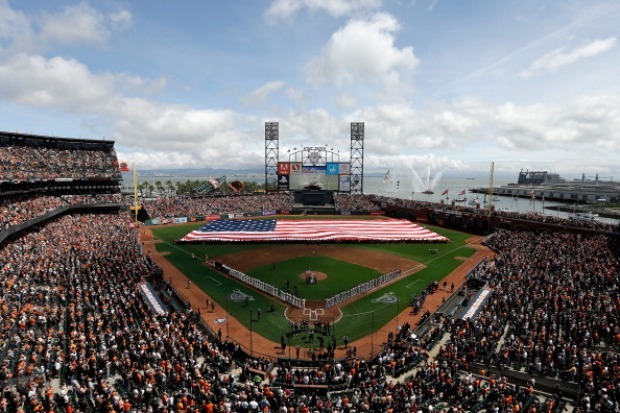 The flag was then passed on to a group of "long-time" Giants fans, who came through the viewing portals, and carried it to center field, where they were met by a group of Giants players, lead by Bochy. Climbing a ladder up into the far right area of the bleachers, the group made their way to the park's flag poles, and as fans were asked to wave the small flags they had been given when entering the park, they began hoisting it up to the sounds of Queen's "We Are The Champions." "I was just really glad they asked me to be a part of it, I felt like a little kid all over again," said pitcher Sergio Romo. With the day's celebratory festivities completed, the Giants then got about to the business of baseball, and played their first home game of the 2013 campaign, defeating the Cardinals 1-0. "It was a lot of fun, it was a great atmosphere out there-we have that pretty much every game, but it was just a little extra today with the flag raising," said shortstop Brandon Crawford. Addressing the media in a post-game press conference, Bochy appeared visibly happy and relaxed when discussing the day's events. "It was a tremendous ceremony, your emotions are just flying seeing the flag coming in and how the fans were involved. Before the game we all had chills, goose bumps, I think some guys had tears," said Bochy. "It's an honor -- these guys will remember this day for the rest of their lives."